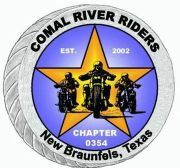 The Comal River Riders Club is a formal club that was established in 2002. We are a diversified group of casual motorcycle enthusiasts. All makes and models of motorcycles and scooters (as defined by Texas law as of 2/5/2018) of 400cc or greater are welcome. Our rides vary in distance and are scheduled on both weekends and weekdays. We are looking for those willing to become active participants on our rides and monthly club meetings. We encourage you to attend one of our club meetings and/or join us on a ride prior to joining to "take us for test ride" to see if we're your kind of club. You'll have a minimum of 30 days to "try us out" before payment of dues is required. Just show up and introduce yourself. UNLESS OTHERWISE INDICATED, ALL RIDES (not club meetings) BEGIN AT THE NORTH SIDE OF BUC-EE'S IN NEW BRAUNFELS. If paying by check, please make it payable to "Comal River Rider's Club". Our Mission: To have a good time riding motorcycles, experiencing different places, and meeting new friends! ** You must be properly insured & licensed to operate a motorcycle. ** Is capable of riding on narrow, twisting back roads.